The Chicago Blackhawks visit Madison Square Garden in a rematch from the NHL’s season opener on October 5, 2015. The Broadway Blueshirts spoiled Chicago’s Stanley Cup banner raising ceremony at the United Center with a 3-2 victory. Since that October night, both Original Six franchises have experienced their highs and lows throughout the course of the 2016 campaign. But, the Rangers and Blackhawks are two of the hottest clubs heading into Wednesday Night Rivalry, which will be televised on the NBC Sports Network. New York enters tonight’s matchup 7-2-1 in its last 10 games and the team owns a 32-18-6 record (70 points) overall. The Rangers and Washington Capitals are tied in the Eastern Conference for the most wins on home ice (21). New York is coming off of an emotional 3-1 win over the Philadelphia Flyers this past Sunday. Chicago recently fell out of first place in the Western Conference and the Blackhawks are 5-4-1 in their last 10 outings. The Hawks’ road record is above average – though Patrick Kane and company are 5-7 vs. the Metropolitan Division this season. Chicago’s last game was a blowout, as the Blackhawks ran the Toronto Maple Leafs out of the United Center, 7-2. 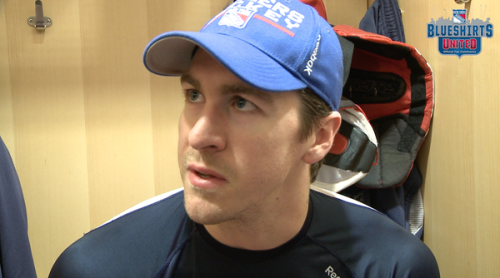 The Blueshirts’ captain makes his return after being sidelined the last four game due to a concussion. It will be interesting to see how often head coach Alain Vigneault looks to use defenseman Ryan McDonagh against an talented Blackhawks squad up front. Still, look for McDonagh to get involved early and potentially see a majority of his ice-time during the first 30 minutes of play. The Rangers are 240-246-98 all-time against the reigning Stanley Cup champions. The two split the season series in 2015 – both games were decided by a score of 1-0. The Original Six matchup tonight is more of an important game for the Rangers; as it will be a worthy test and one step closer to whether or not the Blueshirts are one of the favorites to come out of the Eastern Conference come May, again.